My Last Post for the Shawn Petite Creative Team! This is my last post for the Shawn Petite Creative Team! Learn how to layer decorative napkins to create a one-of-a-kind collage art journal page! Another video tutorial is up for the Shawn Petite Creative Team! Learn how to “paint” with paper to create this rainbow collage canvas! On My Art Table Lately: Design Team Post Updates! Learn how to create a textured mixed media canvas, easy mixed media portrait, and art journal spread using masks and stencils! I've got another Creative Team post up on the Shawn Petite blog today! Learn how to create this lovely, layered ar journal page with stencils, washi tape and my favorite art materials! Learn how to create a quick collage background and mixed media portrait in your art journal with this video tutorial! Learn how to use a printed tissue paper as collage in your art journal in this video tutorial for this week's Quick Tip Tuesday for the Shawn Petite Creative Team! 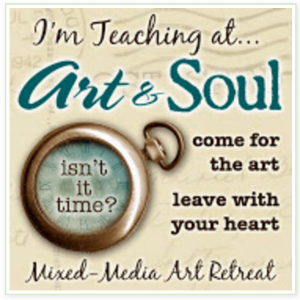 Want to learn how to blend collage images into a mixed media background? Check out my latest video tutorial for the Shawn Petite Creative Team!